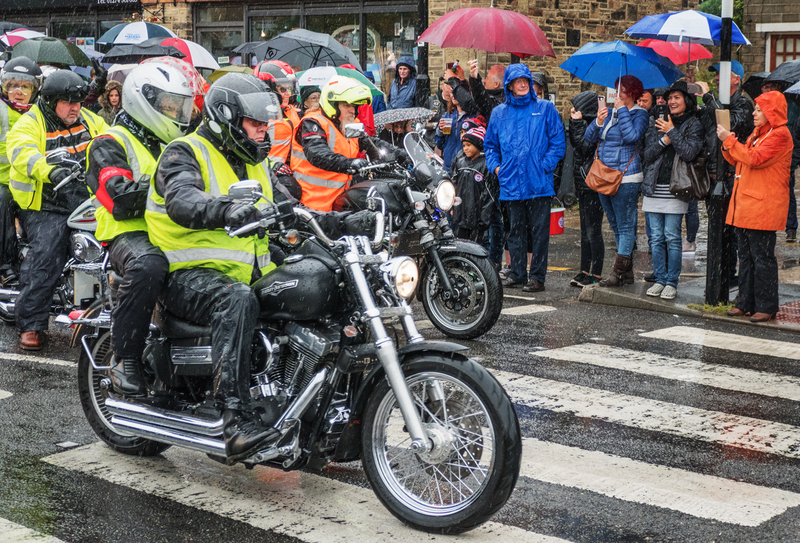 The Club’s season of outings came to a soggy end on 26 August with the Harley Davidson Charity Ride-Out taking place in drenching conditions. Bikers set out from the centre of Baildon on a round trip that embraced Pool and Otley, all in aid of the children’s department at Bradford Royal Infirmary. For the photographers present it was reminiscent of a certain day at a harness race meeting where one very damp Club member took a shot in a downpour that led to an award winning photo. We planned 23 outings this season but oddly it was fine weather that caused four of the events to be cancelled. There wasn’t enough water in the rivers for our visits to two waterfalls, low water levels forced the closure of Bingley Five Rise Locks, and the risk of track-side fires put a stop to Flying Scotsman hauling a train over the Ribblehead Viaduct. Still, the good weather has meant that members have had plenty of days when they could ‘do their own thing’. We are looking forward to seeing the results from the outings and from other photo-opportunities when our evening Club meetings resume on 14 September in Addingham.